Blue Moon Farm's Jean Keene told me this, so I tried it -- tried it out on other people, too. 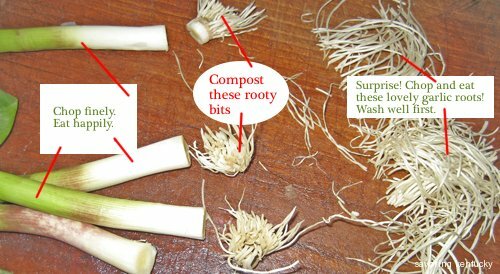 Yes, the cleaned roots of green garlic are edible. Tasty, in fact. Delicious. Jean says she heard about the roots' use in Asian kitchens; clear, strikingly flavored Thai and Philippine broths come to mind. I chopped these roots finely and included them in Cornbread Bread Pudding (no, that's not a bread-bread typo) - about which savory treat I will write more later. Today I'm sticking with tales of my continuing education in all things garlic. Ten years ago I had no idea one could eat young green garlic, nor just how lazy it makes me. I learned about green garlic from Blue Moon, and look forward to it all year. The wonderful taste and smell of garlic during April and May -- chop-read green garlic -- comes without the usual struggle I have getting those little tissue paper wrappings off each individual garlic clove. Yes, I know the smash trick; I have a clever garlic roller designed to help with peeling individual cloves; I find as many ways as I can to use the cloves whole and squeeze out the cooked garlic later -- but even with all those tools and tactics, peeling is more work than chopping up a green-onion sort of thing that is, instead, a green garlic. About five years ago I learned from my same Blue Moon High Priestess of Tasty Goodness (along with her consort, his Garlicky Highness, Leo) that the green scape (flower stalk in hardneck types) is another fantastic no-peel way to enjoy fresh garlic, usually in late spring early summer. I graduated to a higher degree garlic aficionado-ness just two weeks ago when I found a frozen container of Blue Moon Garlic Scape Pesto in my freezer. Never mind how it got there, how long it had been "resting," or how it happens that as a weekly Blue Moon devotee I have never REALLY tried this unctuous, sensuous stuff. What matters is how good this pesto is. Garlicky, yes, but without the mouth-stinging edge. Rich in a deep umami way. I ate it on Nut Thin crackers, and when it dripped off onto my fingers, some licking of fingers followed. I dipped steamed broccoli and asparagus into it. I put a dot on brown rice. I stirred in a bit of sour cream and put tiny dots on this and that entree. I don't eat much pasta, but I might start, because this pesto has to elevate pasta to another realm. You can buy garlic scape pesto year-round from Blue Moon. I can report for certain that you can keep it in your freezer for, oh, at least nine months, and it will wait happily to become useful. Or make your own once the scapes come into season. Although my personal discovery of Blue Moon's pesto seemed akin to bumping into a new food planet, previously unknown to humankind, when I google "garlic scape" -- not even "garlic scape pesto" -- quite a few tasty garlic scape recipes turn right up. You try it, too. Humbled. Surprised. Late to the table. I confess to being a slow student in garlic studies. I never knew remediation could be so tasty.